GCM5000 is a stylish and fully versatile single serve brewing system. Manufactured by Gourmia, this all-in-one system has all of the innovation and reliability you would expect from Gourmia. Creating a balance of features, function and style, this model offers the best of all worlds. Not only does this system brew Nespresso pods, but it is compatible with all variations of K-cup and other single serve brewing pods. The Gourmia GCM 5000 is the perfect brewing system for anyone who wants a blend of simplicity, versatility and reliability. While many single serve brewing systems specialize in espresso or coffee, the Gourmia GCM 5000 is designed to brew both coffee and espresso. That makes this model a cut above the rest, as it provides a versatility not easily found in other systems. Additionally, the ability to brew coffee or espresso is an ideal feature for an office environment where different tastes can often be hard to please. The all inclusive brewing feature also makes this model very cost effective as it is essentially two units in one. Another element of versatility is evident in the fact that the Gourmia GCM 5000 is capable of brewing any form of single serve coffee. Choose between K-cups, Nespresso pods or any other variety of single serve coffee capsules. The ability to brew any type of single serve beverage is another plus for any environment where various preferences prevail. Furthermore, this opens up your horizons regarding the almost infinite single serve drink options available. Now you can explore coffees from all over the world, in addition to locally produced specialty blends. The Gourmia GCM 5000 comes complete with an automatic milk frother. This enables you to enjoy your favorite latte or cappuccino in the comfort of your own home. Now you can impress your friends or coworkers by showing off your newfound barista skills! An easy to read LCD display helps to make programming quick and easy. Simply choose the size and temperature of your beverage, insert the capsule of your choice and you are ready to go. The Gourmia GCM 5000 offers just enough options to allow for full customization of any beverage without making the model too complicated to use. Unlike other brewing systems that virtually require an engineering degree to figure out, this unit will prompt you through your choices, helping you to brew the perfect beverage each and every time. How to clean your Gourmia coffee machine? Cleanup is quick and easy as well. The drip tray is fully removable, allowing you to give it a quick rinse in the sink during regular use, or a more thorough cleaning for bigger messes. Additionally, spent capsules are ejected into a compartment for ease and convenience. Instead of having to throw away spent capsules after each use you can now make several beverages before needing to empty the spent capsule chamber. This is an ideal feature for any small business who wants to make their customers feel extra well taken care of by offering carefree coffee shop quality beverages. A 1.6 quart water reservoir ensures that you will have plenty of water to brew multiple beverages without interruption. When water is low you can fill the unit easily and conveniently by either simply adding water to the reservoir or by removing the reservoir altogether. The ease with which the water reservoir can be removed makes cleaning it quick and easy as well. The Gourmia GCM 5000 is capable of producing a full 19 bars of pressure. This means that you get the same performance from this brewing system as you would from the brewing systems at your favorite coffee shop. Now you can create the perfect latte or cappuccino while still wearing your robe and slippers! Last but not least there is the elegant design of the Gourmia GCM 5000. The brew spout is high enough to accommodate anything from espresso shot glasses to full blown travel mugs. The metal housing of the unit comes in three chic colors, silver, white and red, and requires nothing more than a quick wipe with a damp cloth to keep clean and fresh. No matter what the décor, the Gourmia GCM 5000 is guaranteed to not only blend in, but to add a real touch of class as well. 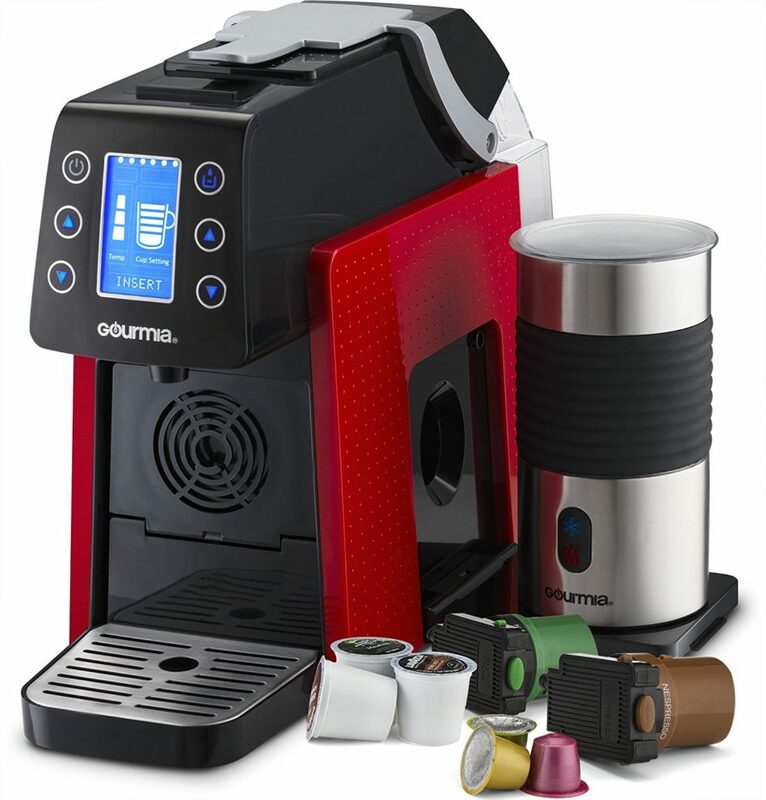 In summary, if you are looking for a reliable, elegant, easy to use brewing system, the Gourmia GCM 5000 is definitely a model you will want to consider. Providing the full range of brewing options, there is no beverage that this system cannot create. An easy to read and use interface also makes this model a top pick. 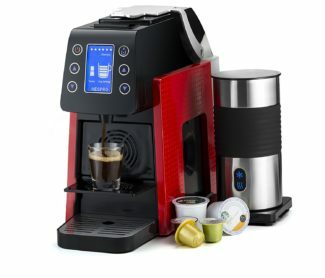 Whether you are looking to enjoy your favorite coffee beverages at home or you want to add a touch of class to your work environment, the Gourmia GCM 5000 is an excellent choice for you! Previous story Coffee Pods vs K-Cups – What’s the difference?